S. Chris Edmonds is a speaker, author and executive consultant. 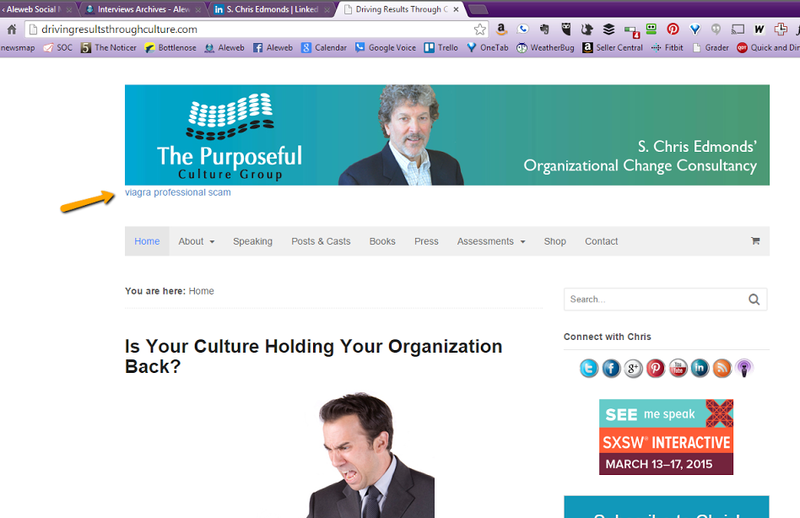 Chris founded his consulting firm – The Purposeful Culture Group– in 1990. He has also served as a senior consultant with the Ken Blanchard Companies since 1995. Chris has helped hundreds of companies from a wide range of industries create high performing, values-aligned cultures over the years. Chris’ latest book, The Culture Engine, presents his proven framework – formalizing a team or company’s purpose, values and behaviors, strategies, and goals in an organizational constitution. When leaders align behaviors and practices to their organizational constitution, amazing things happen. Employee engagement goes up (by 40 percent or more). Customer service goes up (by 40 percent or more). Results and profits go up (by 35 percent or more) – all within 18-24 months of engaging in their culture refinement. This business displays itself online to an environment consisting of a mix of websites based on the WordPress platform. I had five websites - my main blog/podcast/business/store site, my music site, my book site, my positivity-works site, and my culture leadership roundtable site. All are Wordpress sites, current version is 4.2.3, they are auto-updated through WP, using the WooThemes Canvas theme. My hosting provider is BlueDomino. I have no idea about the server specs! I shut down the positivity-works site in April - which you’ll learn more about below. Chris had a multitude of online presences that needed attention. With all the activity that Chris was doing, he found himself facing a business problem when some of his customers noticed there was something wrong with one if his websites. No one needs such news in December, as everyone is thinking about holiday gifts and people like to focus on quality family time. line 239, column 0: XML parsing error: :239:0: junk after document element. This was the first time Chris heard of Sucuri and he became curious. At about the same time, he received an email from his web host indicating they had found malware in some of his Wordpress installations. The worst case scenario for any business happened: they suspended his account, thus shutting down all five websites. It meant that all his online businesses were now offline, no longer visible to clients and prospects, rendering his online presence invisible. Even the Google searches were pointing to 404 “website not found” errors. To have my main site and my book site pulled down was a huge issue. As most people do, he initially tried to fix the problems himself. My hosting provider indicated what files were infected, so I started cleaning them up. I began doing some other research and found this link about the SoakSoak malware campaign which caused Google to blacklist 100,000 Wordpress sites. In this article, Daniel Cid from Sucuri was quoted as saying a photo slider plugin was the culprit. That compromised plugin (a part of many photo plugins, including the NexGen plugin I was using) was how sites were being infected. So, Sucuri was top of mind as I was scouring my WP folders at my hosting provider for the infected files. I spent nine hours on December 14th cleaning up those files on my main website. On the same day, Chris purchased Sucuri’s CloudProxy Firewall package for his main website, ‘Driving Results Through Culture’, while also changing the photo slider plugin he was using to an alternative. After making sure that his website backups were up to date - but not restorable, alas - he purchased a WordPress cloning software solution on December 15, 2014 to solve the problem. I quickly added the firewall to my remaining four sites that day - then started looking at the Malware Removal option. I have had no issues since. None. It’s cool to see how many attacks my remaining four sites still attract each day - but your firewall remains firm. I can see the Sucuri Platform monitoring “live” - I know when the last daily scan occurred and can see if any issues (blacklisting, compromised files, etc.) have been found. They never have - so far.